I have submitted a few tickets like this and the issue seems to come back. I have sales people using this form and they attach documents and they appear to upload, however when the form emails out to the list of recipients, the attachments don't come through, or sometimes just one attachment comes through. I just tried to test this myself and I get a "failed" message whenever I try to upload something. Can you please try re-embedding the form with the iFrame embed option, then let us know if the problem still persists? We'll be looking forward to your results. Thanks! Okay getting someone to fix this now. Will let you know. Can you please tell me how to fix this? It is quite a frustrator to our Sales team. Are the files missing from the notification emails only? Would you mind checking your form's submissions page and see if the files are there? I checked the submission in the system and it is missing the attachments too. This has been the case with all of them. May I ask what specific file type you're trying to upload to the form? How big exactly is the file? Although I cannot reproduce the issue on my end, I believe we may have something as there is another user reporting the same problem, but it is specific to files larger than 100MB. We will conduct further investigation and will let you know the results soon. They are both PDFs. One is about 250KB and the other 900KB. P.S. This same issue has occurred over a dozen times now. Something seems off. I still can't reproduce this problem. Can you please try uploading via the following (different) URLs? Note that one is using .us while the other is using .com. Please do inform us your results. I don't know that you are going to be able to reproduce it. I always try reproduce it myself and am sometimes ables to, but it doesn't happen every time. Hi, I too could not reproduce the Failed issue on the upload field using the form in your website. May I inquire if you are able to encounter this issue most recently (at least the past 24hrs)? I can only ask this, as I have tried using your form in between 10mins span for 3x.. and all are success. If this issue persist on your end, may I suggest to take on NeilVicente's suggestion to update the URL of the form to www.jotform.us version. Base on your account detail, the U.S. location is more ideal because of the server location. Hope this help. Please update us if you have further details to share. The file shows in the form before pressing submit, however after submitting it, it doesn't come through either into Jotform or to the emailed recipients. I will have our web guy update the form to the .US and see if that helps. P.S. yes it happened in the last 24 hours on the form that I sent to you. If you can go in there and look, it is for HIS-1504 under sales close form. I checked the HIS-1504 submission on your form, and indeed there is no attached uploaded file to it. I looked at the conditions and there is only 1 that has to do with the upload field that was first missed. 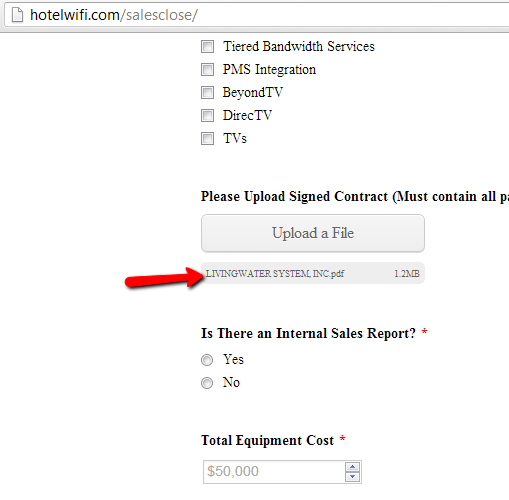 That condition was fulfilled, ie; the salesman selected the correct item to require that upload field. He said that the docs appear when he browses and enters them into the form, however they just don't come through after the submit. Your test form came through fine. I see it also. Please just delete the test I did to offset your submissions counter and space. As is now, I am not really able to duplicate the previous issue encountered by your form user. I could elevate this to our next level support -- but I have no reasonable info yet to classify where the problem would be . Since the form is embedded on your website, would it be possible you have some kind of audit trail log that you can check on your webserver during the time when submission HIS-1504 accessed the site? It may help us figure out what could have transpired during that time. Okay so this is happening again. Started up again yesterday. We implemented all of the fixes you mention and attachments are still not coming through. Is this something that may be browser specific? How have you become aware that it is not working properly? How many people have reported an issue? What devices are using to upload? Is it always the same PC & browser? Are the files typically much the same size and file type?